Time to share the peace pipe, a vision quest awaits! Developed by Hollow Tree Games, Shape of the World is a soon to release title that will no doubt offer Switch owners a gaming experience they’re not quite used to. Sure, in the last decade, we have had a rise in surreal exploration games, but that doesn’t mean we’ve all played one, but after having the Fe-nomenal Fe release earlier this year, there certainly is more of an appeal in games like Shape of the World. But is it enough? Unlike in Fe, instead of being able to play as a fox-like creature in a fantastic forest, you the player, are the protagonist and Shape of the World, is your journey. A journey through a serene landscape, decorated in psychedelic colours where there is no story, but there is an experience. An experience in the form of a world that is bursting with life that can’t wait to grow around you. The beginning may start off in a singular white space, but with each step you take towards the light, landmass will soon rise and fall, plants and trees will rise and animals will scurry to and from you. The bigger ones however, will charge at you and knock you back, but that’s it. There is no death in Shape of the World, but should you feel the need to fight back, you can always throw seeds at them with the XL button. If you don’t feel the need, feel free to ignore the button as the only controls you will really need to know about is the left analog stick for exploring the terrain and the XR button. XR allows you to interact with monoliths that when enough are activated, can cause staircases to appear that can take you to new locations and areas, in your efforts to go from the beginning to the end. What makes Shape of the World really come into its own though, is a few factors. The soundtrack is responsive and evolves to match the visuals in a bid to immerse you into the game’s world, as you play. 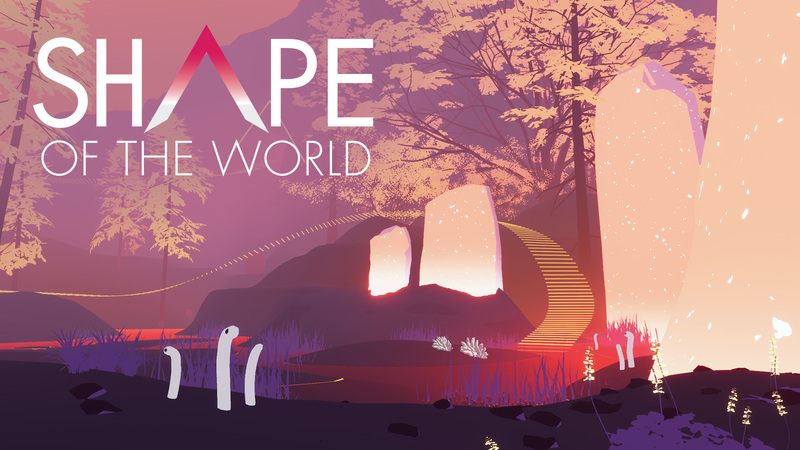 Shape of the World has a procedurally generated locations, so in the event you choose to replay one of the game’s 9 Chapters, the forest/mountains/woodlands/swamp, or wherever you choose, they will not be the same as your latest visit. So, none of your vision quests will ever be the same, thus given the game some originality every time you play and a reason to keep coming back to it. What’s nice as it all is though and by “nice” I mean “wonderfully awesome,” there are a few things you need to be aware of. Because of the minimal gamplay Shape of the World differs and the fact it can be easily beaten anywhere between 1 hour and 3, you can not treat Shape of the World like any other game because it’s not a game, not really. Trying to think logically will not get you anywhere. Shape of the World is the kind of thing you would picture in your mind when meditating, and yet there is no place for the mind in the Shape of the World, for there is only space for the heart and feelings. To play Shape of the World, you have to feel it, go where you feel you should go, react to the changes in terrain, colour and weather conditions, instinctively. Trying to think can have you going round in circles. Trying to solve things that don’t need to be solved. The second you’re thinking “where should I go and how do I get there?” is setting yourself up for a fall, as they can lead to frustration. Frustration then leads to no longer enjoying what is going on around you and the worst thing you can do is give up on the game, because if you do, you will never get to see the gigantic whale fly above your head, swim from underwater caves, or fly above everything upon reaching the thrilling conclusion that is the credits that appear at the end of the game. With such an importance being placed on giving yourself over to Shape of the World to truly enjoy it and its trippy nature, Shape of the World might not be for everyone, but it is one of the most gorgeous and peaceful games that you can lose yourself in, if you give it the chance it deserves. The soundtrack is pretty fantastic, the colours, which will change when you pass through one of the upside down V-shaped gateways, are a delight to behold, but some can be a little too strong on the eyes than others. And above all else, Shape of the World does have the means to offer us peace after another stressful day spent playing the game we call life.